Tree crop growers have a new tool to help them assess the potential impact their growing practices may have on water quality. Know Your H2O, an iPad app developed by the UC Cooperative Extension Agricultural Water Quality Research and Education Program in San Diego, asks growers a series of questions about their growing practices, then suggests Best Management Practices based on UC research that can reduce runoff or leaching of contaminants from orchards into water. Although there are many sources of water pollution, runoff from farms may contain contaminant levels that exceed water quality standards. Runoff from agricultural operations can pick up and carry natural and man-made pollutants, including fertilizers, salts, pesticides and sediments to lakes, rivers, wetlands and beaches, according to Loretta M. Bates, UC Cooperative Extension staff research associate, who leads the Agricultural Water Quality Research and Education Program in San Diego County. Avocados and citrus are major tree crops in San Diego County, but "the app should be useful for growers of any tree crops," says Bates. Internet access isn't needed for the iPad to perform the assessment, but you will need connectivity to email the results to yourself because the application won't store the data. "In the near future, we will have apps available for nursery and greenhouse growers and the apps will be available for use with devices other than iPads," Bates says. The tree crops app was developed by Ryan Krason, digital media specialist for UC Cooperative Extension in San Diego County, and Valerie Mellano, former UC Cooperative Extension advisor in San Diego County, with a third-party app developer. Krason and Bates are currently working on customizing the app for nursery and greenhouse operations. The iPad app for tree crops is free and can be downloaded from the iTunes store. Search for "agricultural water quality." 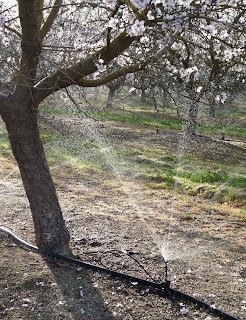 For tree crop growers who don't have an iPad, the self-assessments can be printed off the Web at http://ucanr.org/sites/agwaterquality/files/121819.pdfand completed by hand. The Agricultural Water Quality Research and Education Program also offers printable self-assessments for greenhouse and nursery businesses and animal agriculture operations on the Web. While the iPad app will generate a report of suggestions, the print versions offer statements that address a group of questions. For more information about the UC Cooperative Extension Agricultural Water Quality Research and Education Program, its iPad water-quality self-assessment app or other online assessment tools, visit http://ucanr.edu/sites/agwaterquality/Grower_Resources.